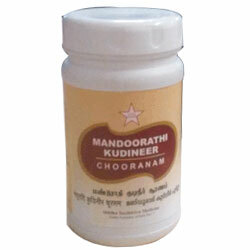 SKM Siddha & Ayurvedha Mandoorathi Kudineer Chooranam Treats Anaemia, Oedema, Jaundice, Ascites, Swellings, Abdominal Tumour. Enlargement of liver and spleen and Flatulance. Anaemia, Oedema, Jaundice, Ascites, Swellings, Abdominal Tumour, Enlargement of liver and spleen and Flatulance. Prepare 30-60ml decoction with 5-10gms of chooranam and take twice a day after food or as directed by the physician.